We have put together a handy guide for order cut off dates for pre-Christmas delivery. Please note our handling time can be up to 2-3 business days depending on the item. We aim to dispatch things as quickly as possible as we understand that at this time of year everyone wants things urgently, however there are delays due to the volume of orders. Please consider this when ordering. This guide is based on estimates provided by Australia Post eParcel service and couriers. 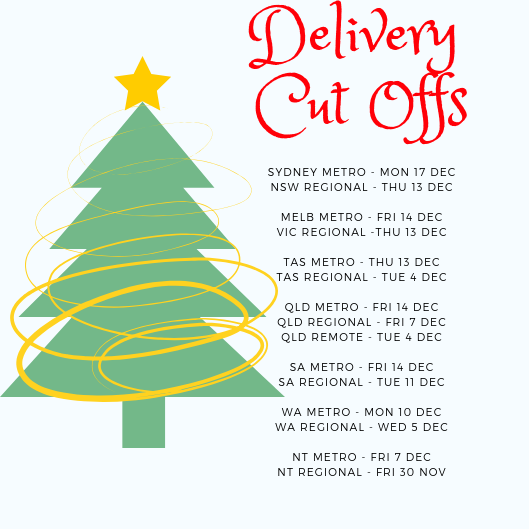 While couriers and Australia post are working hard to get all packages delivered prior to Christmas - with extra drivers and Saturday deliveries, they unfortunately do not guarantee delivery prior to Christmas and these dates are estimates. Express post through eParcel is also not a guaranteed next day delivery service, but is a "fast as possible service" (We are not able to send items using Australia Post over the counter express post). Packages are taking longer to arrive during this busy period. Please track your items online and contact us with any issues so we can chase up the courier. Couriers and Australia Post will be closed from 24th December to 2 January. Any orders that have not been delivered by Christmas will be delivered after January 2, keep in mind there is a huge back log of deliveries at this time, so deliveries will be slower than usual. Most of our warehouses are closed from 21st December to January 2 or Jan 7. Any orders placed between Chstimas and New Year will be shipped out after the warehouses open. Please view each product page for shipment information. We thank you for your support in 2018 and wish all our customers an enjoyable Christmas and holiday season.